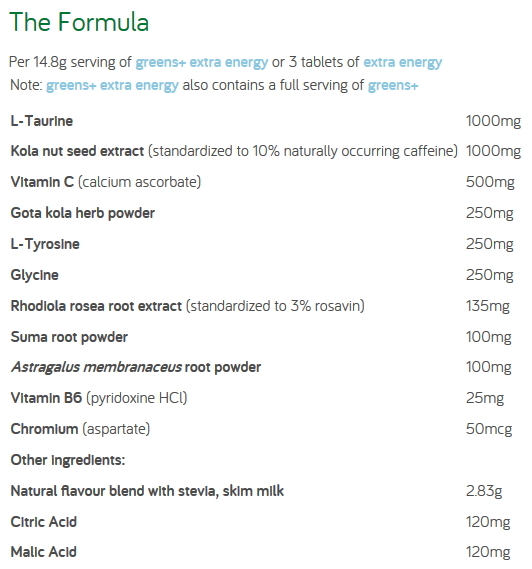 Recommended Dosage: To improve overall well-being, to (temporarily) promote alertness, wakefulness, enhance cognitive performance, relieve fatigue, increase endurance and enhance motor performance, mix 1 scoop (14.8g) of greens+ extra energy to one and a half cups (375mL) of pure water. Shake well. If you are a new user of greens+, begin with 1/3 scoop daily and gradually increase to a full scoop daily over a 3 week period. Caution: Use with caution if allergic to bee products.Not to be taken by children, during pregnancy, while breastfeeding, by those on medication, following a low protein diet, or with chronic health problems unless under the recommendation of a health care practitioner. Do not use if you have gastrointestinal blockage. Discontinue and consult a health care practitioner if symptoms of digestive upset occur, worsen, or persist beyond 3 days. Consumption with other caffeine-containing products or drugs which increase blood pressure is not recommended. This product is not intended as a substitute for sleep. Use with caution if allergic to bee products.